Nigeria's Asisat Oshoala was again named African Women's Player of the Year at the Confederation of African Football awards in Ghana. Her triumph came even though her national team, the Super Falcons, did not play a single game in 2017. Oshoala left Arsenal last February to go to China and faced some criticism. But she felt vindicated by adding the 2017 continental crown to the ones she won in 2016 and 2014. "When I left Arsenal a lot of people said 'your career is going to be gone.' But I told myself: 'I can do this.' And here we are today. "I want to use this opportunity to encourage all the young girls out there - don't let anyone talk you down, don't listen to people, follow your heart." Egypt scored three major triumphs in Accra on Thursday. 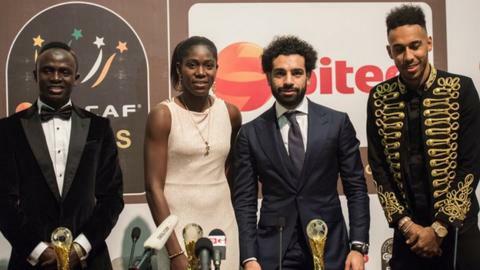 As well as Mohamed Salah's coronation as African Player of the Year, the Pharaohs were recognised as men's national team of the year and boss Hector Cuper was coach of the year. The honours are recognition for a year in which they reached the final of the Africa Cup of Nations and qualified for the World Cup finals for the first time since 1990. Salah picked out Egypt's success when discussing his individual award. "2017 was an unbelievable year for me - I had a fantastic time with the national team," he said after his triumph. Former Ghana star Ibrahim Sunday was given a special "Legend" award and the "Platinum award" was given jointly to the President of Ghana, Nana Akufo-Addo and the President-elect of Liberia, the former World Footballer of the Year, George Weah.